If we look back to the history, we would notice that the world has been changing more drastically and quickly especially after the Industrial Revolution. Telecommunications Revolution made the change even more strikingly. Can you think of explaining what you do in your everyday life today to the people in 1960s without making them think that you are mad?? Or, can you think of something you could do or to prepare now for your lives after 50 years, apart from taking insurances? We would like to introduce Kawagoe, a town situated within ‘2 Hours Drive From Tokyo’ as an example of the action by wise far-sighted people. Before talking about Kawagoe, we would like to share the history of the recent 50 years housing in Tokyo as the background information. In 1926, the first apartment was built in Tokyo by DōjunkaiW, a corporation set up a year after 1923 Great Kantō earthquakeW to provide reinforced concrete collective housing which were earthquake and fire resistant. They built 16 apartments but all of them have already been demolished. 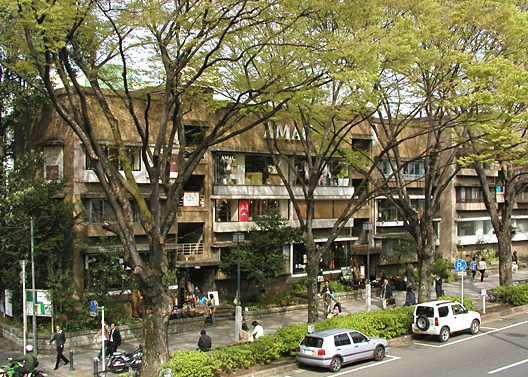 We think the most famous apartment was the one in Aoyama area until 2003, now where Omotesando Hills stands. Co-op Olympia, the apartment building you will see in Omote Sando, Tokyo. In the early 1960s, there was the first boom of having apartments as houses, when the Olympics was held in Tokyo in 1964. 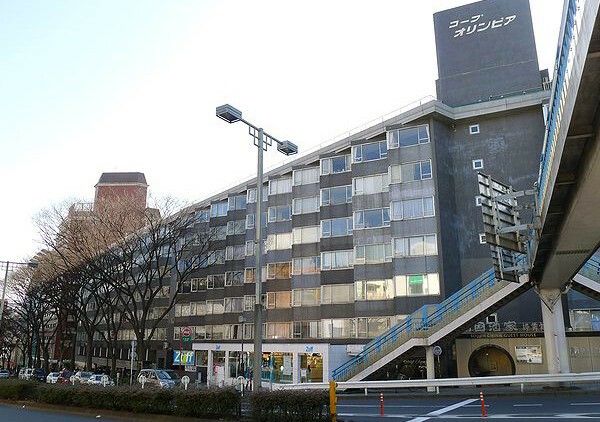 The first luxury apartment was built near Yoyogi Koen which was first used for the Olympics. After that, many apartments were built in Tokyo. In the beginning, apartments were recognized as something special, which may have been the reason why apartments are still called “mansions” in Japan. This boom of apartment construction, as well as buying or renting them as housings, spread among people mainly in big cities as Tokyo where the land prices were too high to buy. This phenomena gradually spread out to the suburbs as the price of the land grew higher as more and more apartments were needed for the people who gathered to Tokyo for their work. Moreover, instead of buying or renting houses in the place where land prices were high, people sought for larger houses exchanging their certain time of commuting to their workplaces in Tokyo. Regarding such circumstances, the development of the suburbs started rapidly, which left us negative legacy as damages of the local environment. On estate development, mountains, hills and fields were demolished, including sacrifices of many old historical buildings. However, the choice made in late 1970’s by Kawagoe changed the future of the town positively. Residents of Kawagoe who loved their hometown said “No” to such business fluctuations of estate development. They stood up to fight against the rampant construction of new high-rise apartments. The citizens, unfortunately not the government, who were effected by the philosophy of National Trust, made a social movement to preserve their cultural assets of the town. Thanks for their attempt, we can now admire the traditional town with beautiful lined up Kura (storehouse)W along the streets of Kawagoe. We hope, in the near future, that the high-streets would be closed for cars damaging the old buildings with its fumes and pant so that the historic center of Kawagoe would become a ‘Centro Storico (historic center)’ like in the European countries. It would bring the inconvenience of transportation but we think that culture is born and preserved within the inconvenience. If the people of Kawagoe, 30 years ago, had pursued only for the convenience, the town would have been one of the frequent developed towns in outer suburbs of Tokyo with high-rise apartments and supermarkets. 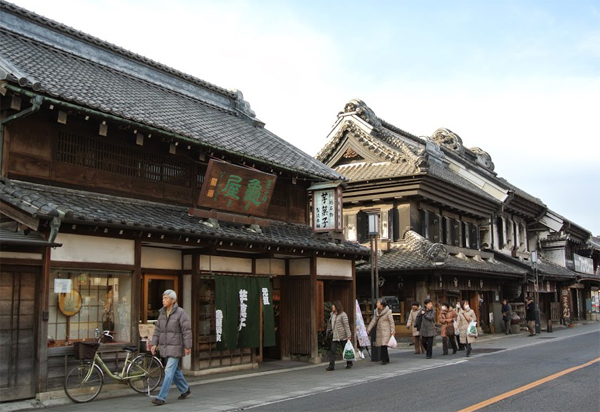 The old city area of Kawagoe has been rewarded as one of ‘the Most beautiful street in Japan’ in many categories. Old store buildings standing along the streets would definitely invite you to enjoy the atmosphere of Edo period Japan. Today, Saitama prefecture does not face the sea, but in Jomon period, where the sea level was higher than the present, there was the inland sea very near to Kawagoe where several ancient villages existed. ** Please refer Saionji Net. “What was Edo like before Edo period” for the sea level in Jomon period. In progress of time, the agriculture began, making the village larger. 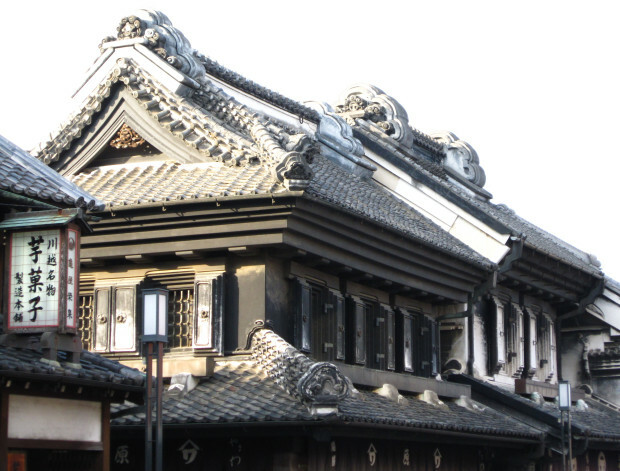 Eventually, Kawagoe became a well developed country ruled by Kawagoe clan in the medieval Japan. The heavy and strong looking roofs of ‘Kura’ style building. In Edo period, the rivers were also organized because they were important route of transportation before Meiji period when the trains were introduced. Since there was a river running very close to Kawagoe, the flow was organized into Edo Kawagoe town which thrived business between Edo as a grain supplier, especially with sweet potatoes, furniture and fabric. Kawagoe was the town where the latest culture of Edo arrived out in the suburbs and the town was called “Small Edo”. After Meiji period, Kawagoe was prosperous as a merchant town. In 1893, there was big fire in Kawagoe which burnt down almost one third of the city. With this unfortunate experience, people started to construct Kuras which are resistant to fire and are well preserved with the love of local people acting in late 1970’s, making Kawagoe so famous and so popular now. People are actually living and doing their business in Kura buildings where we, tourists, can enjoy shopping or just strolling around the streets like as if we are in Meiji period, before Japan was yet not Westernized. Shops are there, like as they were in Edo or Meiji period when there was no Western influences. Kawagoe IC of Kan-Etsu ExpresswayW, or National Route 254. Kawagoe Station of JR Saikyo Line from Shinjuku, Tobu Tojo Line from Ikebukuro, Yurakucho Line and Fukutoshin Line of Tokyo Metro.